The choice for true Amish furniture stores is few and far between. The good news is the leading retailer in Ohio is the only one you need. 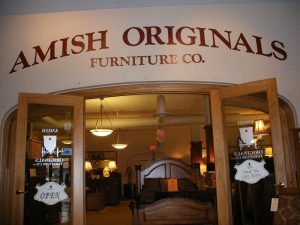 Whether you live directly in Westerville Ohio or travel from Grove City, Delaware or Dublin, Amish Originals Furniture Company has everything you need and more. There is a reason residents of Gahanna, Sunbury and Mt Vernon and all points throughout central and all of Ohio travel to our Westerville showroom. By making the short trip to shop with us you get more than just the greatest selection at the most competitive prices, you get quality all around. Quality from the best-finished products as well as the customer service you receive. Join customers from Columbus, Upper Arlington and Plain City who have come to rely on the Amish Originals name for all of their home furnishing needs. We are proud to work with over 70 Amish families from around the Northeast Ohio region to be able to offer our customers from around the state the best in authentic Amish craftsmanship. When it comes to furnishing your home, nothing beats incorporating such a time-honored tradition as the styles one can only get from the best quality Amish built furniture. Whether your home is in Sunbury or right around the showroom in Westerville Ohio, you will love the feel and appeal true Amish Originals pieces can bring to your home. Whether you need a single desk for your home office in Dublin Ohio or every room filled for your new home in Mt Vernon, we can help you accomplish your goals. Of course, furniture shopping around Plain City or Delaware is not as likely to help you get the selection you want. You should never have to settle when it comes to the choices you make for furnishing your home. Even when you shop for something as specific as Amish furniture, it is quite possible to have endless possibilities when it comes to your selections. By choosing our showroom to do your shopping from you will be quite pleased to find we are more than worth the short drive from wherever you reside in the great state of Ohio. No matter what you are looking for you can find it by shopping Amish Originals. From accent tables, to children’s beds to outdoor seating there is simply no better selection around. When you travel the distance from Columbus, Gahanna or Upper Arlington Ohio to shop with us, you will find just how customized your shopping experience is. From selecting the pieces to selecting the wood and finish, all of your Amish home furnishings are tailor made to your style and taste. Not only that but your pieces are then built to order using the finest hand craftsmanship furniture making has ever seen. Do not just settle for what is in your area when the finest Amish furniture you could want is only a manageable drive away. Start by browsing online and then come in to our Westerville Ohio showroom to turn your Amish furniture wish list into a reality.